It's an epidemic of suicide. For people who depend on a good harvest to feed their families, earn income, and pay back debts, droughts, extreme heat, and other disruptive events can trigger an existential crisis. When they become commonplace, stretching across entire seasons, year after year, the emotional toll can become too much to bear. 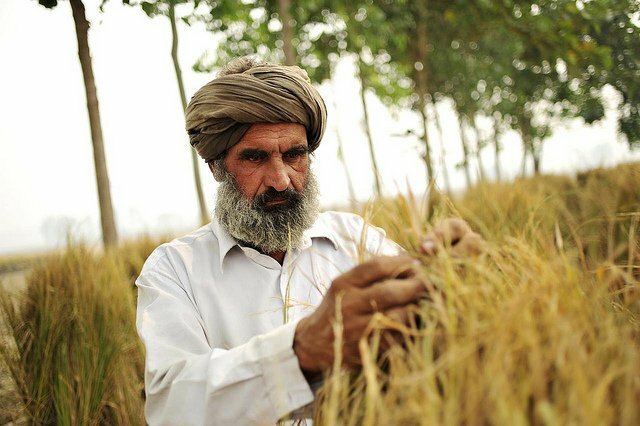 In India, climate change has been upending farming patterns for decades now, and tens of thousands of agricultural workers have killed themselves as a result, according to a new study published in the science journal PNAS. The study makes a startling assertion — climate change is responsible for an estimated 59,300 suicides since 1980. This is part of a larger crisis of farm workers in the country. More than 300,000 Indian farm workers have killed themselves since 1995. In 2015 alone, an estimated 12,602 farm workers killed themselves. The farmer suicide epidemic in India has been blamed on various factors, including debt, pesticide use, and industrialization, but the lead author of the report, Tamme Carleton, says that the one strong link appears to be climate change and the many ways it stresses daily life. Carleton found that days that were 1.8 degree Fahrenheit (1 degree Celsius) hotter than normal during the growing season had 67 more suicides. An increase of 9 degrees Fahrenheit (5 degrees Celsius) was associated with an additional 335 suicides. Regular temperature spikes like this lead to crop failures, which can burden farmers with more debt, according to the study. "These crop losses may also permeate throughout the economy, causing both farming and non-farming populations to face distress as food prices rise and agricultural labor demand falls,” Carleton wrote. The study was focused on India, but she said that similar patterns might be found in other countries where low-income people depend on agriculture for their livelihoods. "Suicide is a heartbreaking indicator of human hardship," Carleton told Forbes. "And the finding that this phenomenon is affected by a changing climate implies that it is essential to quantify its effect and consider this relationship as we build climate policy for the future." Climate change could also lead to death in other ways. Air pollution-related deaths could increase by more than 60,000 by 2030 if current climate change trends continue, according to a new study in the journal Nature Climate Change. Since humans breathe air provided by Earth, drink water provided by Earth, and eat food provided by Earth — people get sick as the planet deteriorates. Further, extreme weather events are creating a new category of people: climate change refugees. As populations get displaced from their homes by violent storms, eroding coastlines, and changing weather patterns, they become more susceptible to disease. While the connection between climate change and death is hard to precisely pin down, the risk factors are clear and can be mitigated, according to Carleton. The Indian government, for example, expanded insurance programs to help farmers cope with crop failure and to prevent them from falling into crushing debt. Multiple states have even passed farm-debt waivers in an effort to halt the rise in suicides. Other methods could involve developing and dispersing more heat- and drought-resistant crops, diversifying crops, and taking concrete steps to reduce emissions that drive climate change in the first step. India has shown resolve in its campaign to fight climate change by abandoning coal and embracing solar and wind power. Ultimately, as Carleton’s study shows, the shift to renewable energy is a matter of life and death.